There is nothing better than lots of free spins to play on your favorite games and this weekend all players will have many of those to enjoy at Betfred. The casino will activate a special campaign called the Free Spins Accumulator, with up to £250 in total worth of free spins that an individual player can receive this time. 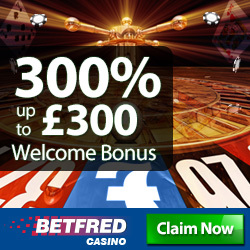 Running from Friday until Sunday, the promotion will grant £1 for each £250 wagered on the casino games at Betfred. There are lots of amazing online games to choose from, including all of the fabulous Marvel series of slots, along with X-Men, Iron Man, Spider-Man and The Incredible Hulk. Comic book fans will have a real treat in the form of those games, but if you wish to try out something other, than there is also the Monthy Python's Spamalot with The Knights Who Say Ni!, that will certainly appeal to the amateurs of television shows and English humor. Before you can fully participate, all that will be required is that you log in to your Beftred Casino account and then select the Opt-In option, provided especially for this event. After that you are ready to enter and play to your heart's content.